"Robert Wagner's Black Crowe's Experience pay humble tribute to the great American Rock Band from Atlanta by bringing a high-energy stage show together with top-notch musicianship! All the greatest Black Crowe's songs, hits AND deep cuts, are played with reverence and sheer joy. Guitars shimmer, crunch, and slide beautifully. Voices, full with melody, dance atop the rhythm section's massive pulse...and audiences are left dancing, breathless, in the aisles. Rock on!!" 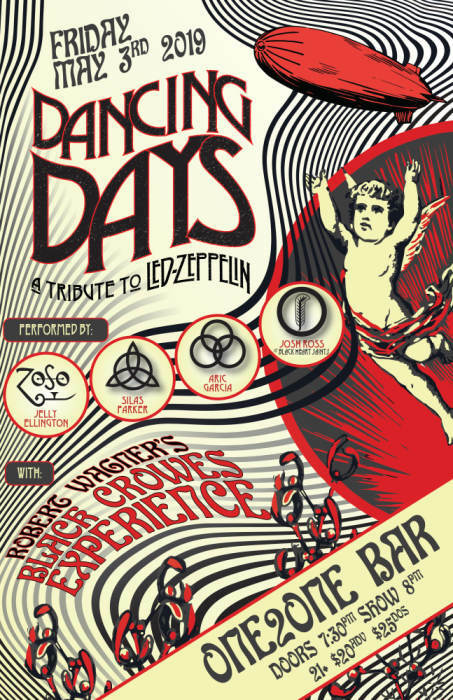 "Dancing Days" is Texas's Ultimate Led Zeppelin Experience. 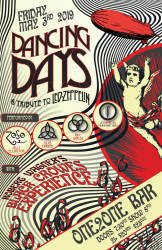 Selling out their inaugural show, they recreate the music, magic, and mystery of a Zeppelin concert, a truly authentic live show experience. The band consists of some of Austin's most rowdy and talented rock n' rollers. Lead singer Josh Ross of the Austin rock band Black Heart Saints, winner of "Best Heavy Metal" band in 2019 Austin Chronicle Music Awards. Guitarist Jelly Ellington, voted Top 10 "Best Guitarist" in 2019 Austin Chronicle Music Awards. Drummer Aric Garcia from Austin rock band Hours Quiet, voted Top 10 "Best Drummer" in 2019 Austin Chronicle Music Awards. Silas Parker, bassist for Austin band "Love & Chaos," voted Top 10 "Best Folk."